A public vote on a convention center hotel: is Metro trying to pull a fast one? 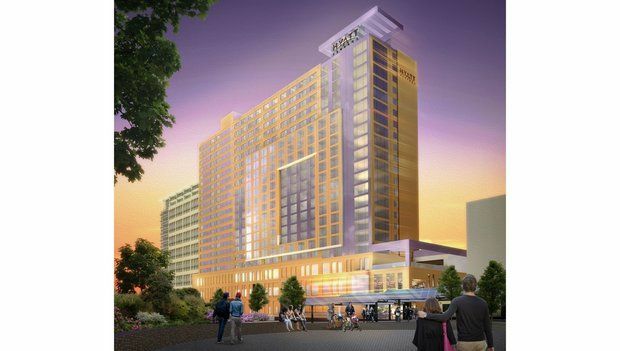 A May 2013 rendering of a proposed Hyatt hotel at the Oregon Convention Center. I wrote recently about the absurdity of building a government-subsidized hotel to support the Oregon Convention Center. Now it looks like Metro is trying to work an end-run through the Oregon Legislature to prevent voters from having a say on the project. On Feb. 24, 2015, Metro President Tom Hughes told the Senate Committee on Finance and Revenue that the bill is no big deal. It relates “strictly to clarifying existing statutory intent regarding Metro’s authority under its home-rule charter,” he said. The bill “merely cleans up awkward word placement in the current statute that has been the basis for serial lawsuits by opponents of the Oregon Convention Center hotel whose goal is to prevent the project from moving forward,” he added. Dilorenzo expressed the view that the courts would ultimately agree that residents had a right to vote on the hotel project . “Please do not deprive the voters of their last chance to avoid what could be another government subsidized albatross,” he said. Ignoring DiLorenzo’s concerns, the Senate Committee On Finance and Revenue reported out the bill by a 3-2 vote, with Democrats Mark Hass, Chris Edwards and Chuck Riley voting in favor and Republicans Herman Baertschiger Jr. and Brian Boquist voting against. On March 4, 2015, the Senate passed the bill by a vote of 20-10, with all the no votes coming from Republicans. Now it’s up to the House. If the bill is just minor housekeeping, what’s the hurry? Given the controversy over the Convention Center hotel, and the ongoing lawsuits to require a public vote, the House should stay out of the mess. If, as Hughes insists, S.B. 64 doesn’t really change the law, but just clarifies it, killing the bill should make no difference to Metro. If the bill would deprive voters of the chance to vote on the hotel, as DiLorenzo alleges, it’s an insult to the public and undeserving of passage. This entry was tagged Davis Wright Tremaine, John DiLorenzo, Metro, Oregon Convention Center, Oregon Legislature, ORS 268.310, S.B. 64, Tom Hughes. Bookmark the permalink.